The KV-220 is a gift Rank III Russian heavy tank with a battle rating of 5.7. It was introduced during Update 1.61 "Road to Glory" in the "Operation S.U.M.M.E.R." event of 2016. The KV-220 is played almost like the previous KV iterations in the Soviet heavy tank line-up. The great improvement over the predecessors is the improved all-around armour to 100 mm, meaning that the tank can angle its hull with more confidence without revealing a side weak point or the such. 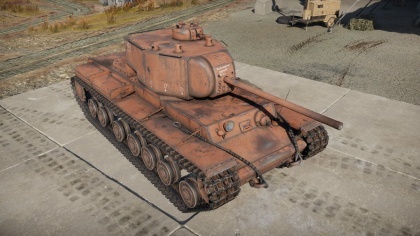 The great armour, decent mobility, and adequate gun gives the KV-220 a diverse role to play in, from a short-range brawler, a support tank, and a long-range sniper. The KV-220 is quite a heavy tank of its own caliber. With 100 mm of armour all around the hull and turret, the angling of the hull can be done to maximize both front and side armour without worry of exposing weak points. Not to mention for its weight, the KV-220 is quite agile. While the 85 mm gun is powerful by its own remarks, it is inferior to the same 85 mm gun that is on the IS-1 that shares the same BR as the KV-220. This is because the 85 mm on the IS has access to the more potent BR-365A and APCR shells. Thus, the KV-220 provides a heavy tank with an impressive arrangement of armour with decent mobility, but with a gun that may feel lacking in the battlefield against other heavy tanks. There is one frontal weak point on the KV-220, and that is the gun mantlet. Not that the gun mantlet area is easy to penetrate, but that it curves downwards on the lower end of the shape. This presents a shot trap able to be exploited by any gun to ricochet a round off that and into the hull roof, which is only 30 mm thick. Do note this when facing an enemy taking aim at the tank. Ammo racks for the KV-220. Tiger I H1/E - They are usually very easy to destroy and protecting the KV-220 is easy with the right angle of armour, but one mistake and the 88 mm guns can eliminate the KV-220. M18 Hellcat - Very fast and manoeuvrable. Do not let them flank, if they get onto the sides, they will be able to penetrate. Try to shoot them from a distance. Tiger II (P/H) - They are better than the KV-220 in every aspect. Try to avoid them and shoot them in their side. Panzerbefehlswagen VI (P) - Usually, the 85 mm can't pen their 200 mm frontal armour, so try to aim for the angled cheeks. Long barreled 85 mm gun. More well armoured than most tanks in it's Battle Rating range. 100 mm of armour all around, sides and rear aren't weaker than the front (Though the slight sloping gives the front about 15 more mm in effective armour). Machine gun turret can traverse 360 degrees. 85 mm shell has great HE filler. When angled properly, the tank can bounce or soak up many shots. Game changer, as it's very hard to dislodge a well positioned KV-220 especially when the player knows it perks. 6 crew for large damage sponge. One of the few Russian tanks that has a good gun depression. Tall profile and hull is longer than other KV and IS series tank. Despite firing the BR-365A used on the other 85 mm armed tanks, this gun mounted on the KV-220 is among the earliest model, so it has lower penetration rating compared to others. Only two types of ammo available (APHEBC and HE). Lower gun mantlet is a shot trap - Can direct ricochets into hull roof. 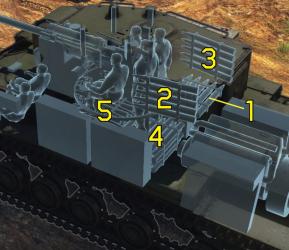 Some ammo will be stored in the turret rear if carrying full ammo. Unlike other tanks, losing a loader will hinder the loading process by a large margin. 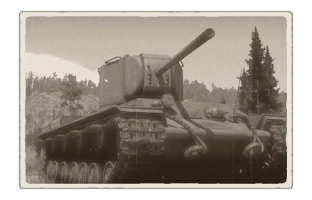 The KV-220 has only been available in Operation S.U.M.M.E.R. of 2016 that lasted from 22 July to 22 August. It was unlocked after obtaining 36 tanker Marks of Distinction.